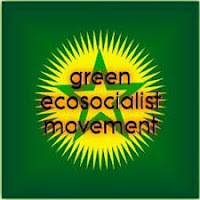 London Green Left Blog: We Need an Ecosocialist Revolution – How Might it Happen? We Need an Ecosocialist Revolution – How Might it Happen? It follows that the social-scientific contributions most relevant to our understanding of the causes and imperatives of climate change have originated outside the mainstream of academic social science, in critical analyses of capitalism. At issue, as decades of research have demonstrated, is the disjuncture between, on the one hand, the increasing demands put on the environment by a process of ever-expanding capital accumulation, rooted in class, competition, and inequality, and on the other, the capacity of the environment to withstand this assault. The growing pressure on the climate, moreover, is currently taking an especially acute form, due to the system’s heavy reliance on fossil-fuel production as a proven engine of capital accumulation worldwide—together with the vested interests of wealth and power that block any transition to renewable forms of energy. In logical-historical terms, capitalism is a system of capital accumulation, a juggernaut in which each new level of economic growth becomes the mere means to further growth, ad infinitum. In the course of its history, capital has been able to “shift” the rifts that it has created in the natural metabolism, displacing them elsewhere, often by imposing such externalities on the most vulnerable populations. The capital-accumulation system, however, has now expanded its operations to encompass the entire planet, disrupting the biogeochemical processes of the Earth system itself, most dramatically in the form of climate change. Even though a conversion to renewable energy is hypothetically conceivable within the system, capital’s demand for short-term profits, its competitive drive, its vested interests, and its inability to plan for long-term needs all militate against rational energy solutions. The imperatives of capital accumulation, as analysed in radical social-science research over the last century and half (beginning in 1867 with the publication of Karl Marx’s Capital), are further complicated by the advent, near the end of the last century, of monopoly-finance capital. In this phase the system is characterized by higher levels of global economic concentration, an accumulation regime dominated by financial-asset accumulation and the globalization of production, and a neoliberal political order—giving rise, in some cases, to neo-fascism. Structurally related to this, as an underlying cause, is the stagnation of accumulation in the advanced capitalist economies, and the world economy as a whole.16 Under this new financialized capitalism, neoliberal policies have sought to remove all regulations on the free flow and amassing of wealth, siphoning more and more of total income into the financial sector, and creating a system of global labor arbitrage or worldwide unequal exchange, the latest phase of imperialism. This countervailing reaction of a system in peril shows the limits of reform in the epochal crisis—both economic and ecological—in which the world is now entrapped. Reform is only ever viable under the regime of capital to the extent that it does not come close to threatening the fundamental conditions that govern accumulation as a whole—and well before that point is reached, vested interests normally intervene to stop substantive reforms. The social transformations demanded today by the reality of climate change (as well as economic stagnation) are of such a scale and significance that large sections of these entrenched interests perceive such necessary changes as a danger not only to the immediate prospects for accumulation, and to their own positions of power, but also to the very existence of capitalism—whose importance, in their accounting, outweighs that of the climate itself. The primary efforts of radical climate activists in the present historical conjuncture have focused on blocking coal and unconventional fossil fuels, such as oil sands, tight oil, shale gas, oil shale, and oil from ultra-deep-sea wells. This approach is based on a complex climate-change exit strategy articulated most definitively by Hansen, who has argued that in order to limit the consumption of fossil fuels in today’s society while promoting the switch to non-fossil-fuel energy sources, it is necessary to increase the price of fossil fuels substantially through a carbon-fee-and-dividend system. Under such a plan, a fee on carbon, imposed and ratcheted up in stages, would be levied at the mine shaft, wellhead, or point of import, and 100 percent of the funds collected would be redistributed as dividends to families on a per capita basis. The result would be that the vast majority of individuals, with lower carbon footprints at lower income levels, would come out ahead, even under the assumption that the corporations would pass on the full cost of the fees—since the costs net of dividends would fall on those with higher carbon footprints and higher income levels. The beauty of Hansen’s scheme is that it would help mobilize humanity as a whole on a class basis with regard to carbon footprints. However, a higher price for carbon, Hansen insists, is not itself sufficient. It is also necessary to focus on the more dangerous carbon fuels, proscribing their use. Hansen has argued that a key to any exit strategy has to prioritize direct action aimed at shutting down existing coal plants, as well as a moratorium on any new coal plants, and the blocking of the Alberta tar sands—since coal and tar sands oil represent the dirtiest fossil fuels, which could quickly break the global carbon budget. True to his strategy, Hansen has put himself on the line and has been arrested in protests against both coal and tar sands oil. Nevertheless, the Hansen exit strategy, though influential within the movement—particularly in its call for direct action to block coal and unconventionals—is weakened by its overemphasis on carbon prices. Anderson has argued that the affluent, who have the highest carbon footprints, can always afford to pay higher carbon prices. More effective would be direct governmental intervention to establish stringent maximum-emissions standards for high-energy consuming devices. This is not a technological problem, he points out, because the energy-saving and alternative-energy technologies already exist, and in many cases can be immediately substituted at little long-term cost to society as a whole. It does mean, however, confronting the “political and economic hegemony” of the system, including neoclassical economics, which is subservient to the capitalist order. All of this reflects a narrowing of the options for humanity and the earth. In the current climate conjuncture, the historically necessary ecological and social revolution, in which humanity as a whole would seek to once again take history in its hands, this time to stave off the impending catastrophes of an irrational system, would have to take part in two stages. The first would involve the formation of a broad alliance, modeled after the Popular Front against fascism in the 1930s and ’40s. Today’s Popular Front would need to be aimed principally at confronting the fossil-fuel-financial complex and its avid right-wing supporters. In this first stage of the struggle, manifold demands could be made and broadly agreed on within the existing system—ways of eliminating carbon emissions and economic waste while also promoting social and environmental needs—which, although inimical to the logic of capital, and particularly to the fossil-fuel industry, would not call into immediate question the existence of the capitalist system itself. However, in the long run, capitalism’s threat to planetary boundaries cannot be solved by stopgap reforms, however radical, that leave the system’s fundamental features intact while simply transcending its relation to fossil fuels. The danger to the planetary environment posed by the accumulation of capital is all-encompassing. This means that the ecological revolution will have to extend eventually to the roots of production itself, and will have to assume the form of a system of substantive equality for all: racial freedom, gender and LGBTQ equality, a classless society, an end to imperialism, and the protection of the earth for future generations. But even if all of this were to fail, and our present hopes were to go unrealized, with the world pushed to the planetary turning point, it would remain true, then as now, that the only answer is ecological and social revolution. There is no next time. It is the fire this time.